Your engine is a beautiful thing. With some gas, air and a spark, it powers you down the road wherever it may lead. Proper preventative maintenance will help your car go the distance. Every engine has different needs and it is important to go to the same shop every time to ensure you are maintaining your engine the correct way. Its well–being also depends on other factors, such as how you drive. 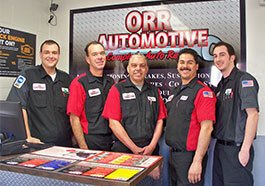 At Orr Automotive, our technicians have the knowledge and experience to help you get the most out of your engine in the Santa Clarita Valley. Whether you come in for a Check Engine Light diagnostic, maintenance or repairs, you’ll get expert service and advice when you need it so you can save your time and money.